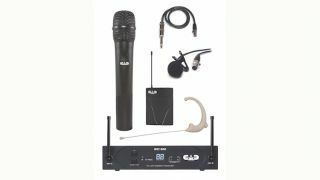 The What: CAD Audio has introduced the new StageSelect 1600 Series UHF high performance wireless system. StageSelect 1600 Series family by CAD Audio The What Else: The StageSelect system includes True Diversity operation to minimize multipath interference along with CADLock Automatic Tone Encoded Squelch that eliminates unauthorized transmissions in the signal path. Optimized XLR and 1/4-inch TRS outputs on the WX1600 receiver provide greater user flexibility. Audio performance has been optimized with a dynamic range greater than 110dB. StageSelect includes the WX1600 Handheld System with the acclaimed CADLive D90 capsule and the WX1610 Bodypack System, featuring the Equitek E19 Broadcast and Production miniature condenser earworn mic, cardioid lav, and guitar cable. Handheld and body pack transmitters have soft touch multi-function on-off/mute/low battery/ScanLink status switches with multi-color LED indicators. High-quality alkaline double AA batteries provide more than 15 hours of transmitter battery life. The Bottom Line: The StageSelect system features frequency agile UHF operation for maximum operating range along with CAD ScanLink technology to precisely scan, select and link to the optimum channel in any RF environment.